Ryan Hofer is the Co-founder of Spectral Aerospace and a student in the Astrophysics program at the University of Calgary. 1. What does Spectral Aerospace do? Spectral Aerospace is an Australian-Canadian space technology startup. We focus on remote sensing as a service by building hyperspectral technology and using artificial intelligence to monitor changes in the natural resources we all use. We have built a hyper-spectral satellite that can cover 90 per cent of the earth every seven days. We are currently focused on building monitoring solutions for oil and gas pipeline leak detection, precision agriculture, aquaculture and other environmental applications. With our technology, we aim to monitor the Great Barrier Reef in Australia as well as the Arctic and Northwest Passage. After losing a friend during my first two years of business school, I started to think about what I would do if I could remove all barriers. That’s how I ended up in the Astrophysics program at the University of Calgary. I had the opportunity to travel to Australia to attend the International Astronautical Congress last September where I saw Elon Musk deliver the final keynote. The experience and the people I met inspired me to start Spectral Aerospace. The idea was literally born in a pizza bar. I met our CTO in Australia in September 2017 and started getting the ball rolling in January/February 2018. As we were trying to build our prototype, we realized we had some big operational challenges. The remote sensing market is massive, but Australia did not have a manufacturing base for space technology. We decided to combine forces with a few other startups to start a manufacturing base for small satellites in Australia, which is where our CTO is located. The next evolution of our company will be working on the data communications side of our technology so that we can better store mass amounts of data. One of my first discussions was with my neighbour who has retired from Suncor. After hearing how aircraft has to fly over pipelines every day to monitor for problems, I realized there had to be a better way. I have my pilot license and know that this type of surveying is subject to human error. Since then, I have connected with members of government, energy companies and other firms focused on remote sensing. In several cases, we found out that we could do it for a fiftieth of the cost in one pass on a weekly basis, taking a tenth to one-hundredth of the time it takes to manually monitor the area. 5. Do you have a team? If yes, who is on it and how did you go about building your team? Our founding team is still just myself and our CTO, Benjamin Koschnick from the University of New South Wales in Australia. We are also working with a few others who are supporting us with the space mission design and data. We connected with three others who have experience in remote sensing at the International Astronautical Congress and they intend to join the team later. In the meantime, I am continuing to make connections in Alberta as well as the European Space Agency. Artificial intelligence visual processing. There is a lot of AI talent in Alberta that I am keen to collaborate with on the global stage. Being able to operate internationally among different cultures and make connections abroad. I have collaborated with people internationally for a massive space project. The space industry is expected to grow by 250 per cent over the next twelve years. I want to build a space-technology hub in Calgary. We want to become the best remote-sensing company in the world by providing accurate data that can help organizations respond to the world’s environmental challenges. We want to complete a successful seed round by the end of 2019. We are looking at pre-seed right now and working with the federal and provincial government, as well as international governments. 9. What are your plans for your company once you graduate? By the time I graduate, I hope to have a patent, trademark and published scientific paper. I want to be seen as an expert in this field and build a strong aerospace presence in Alberta. The space industry is one of the most collaborative industries on the planet and I hope to continue to build my international network and help humanity reach the stars. 10. How have the programs and support available at U of C and Hunter Hub helped you in your entrepreneurial journey? The Hunter Hub has been instrumental to my experiences to-date. 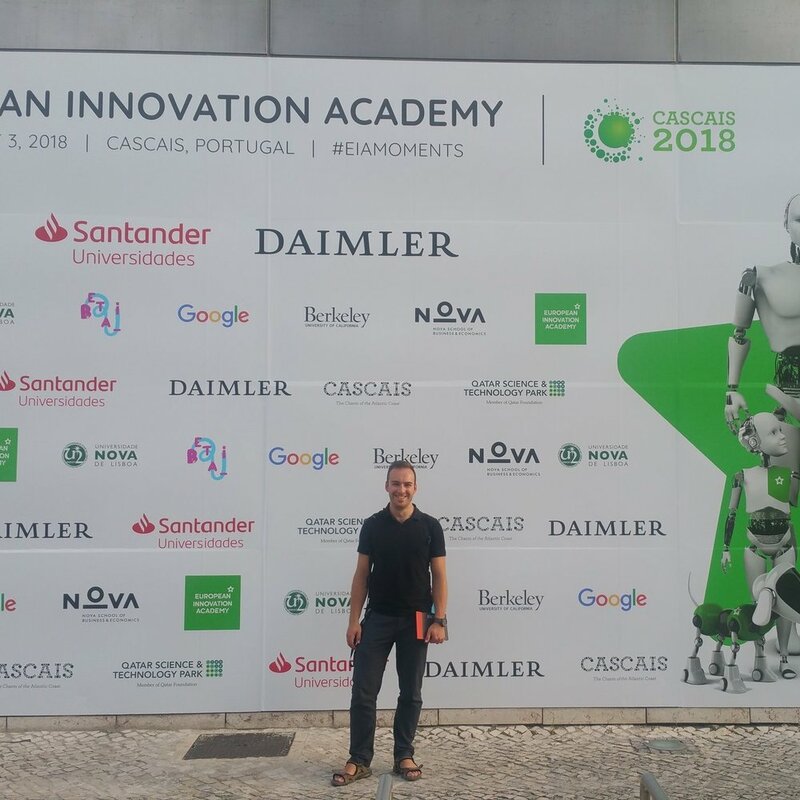 They sponsored me into The Inc. at Calgary Technologies Inc. and helped me attend the European Innovation Academy in Portugal. I am currently working with them to build Collegiate Entrepreneurs’ Organization (C.E.O.) Calgary because I know that there must be dozens of people like me who don’t have a comprehensive understanding of how academia, entrepreneurial thinking and research fits together. 11. What was the biggest surprise you encountered building your startup? What did you learn from these? We are now building our technology and starting to get our name out. We now have competition which we haven’t seen to-date, which validates what we are doing. People are starting to come to us to work and collaborate with us, which I didn’t expect. I thought I would have to do all of the outreach, so it has been really cool to see that level of interest.